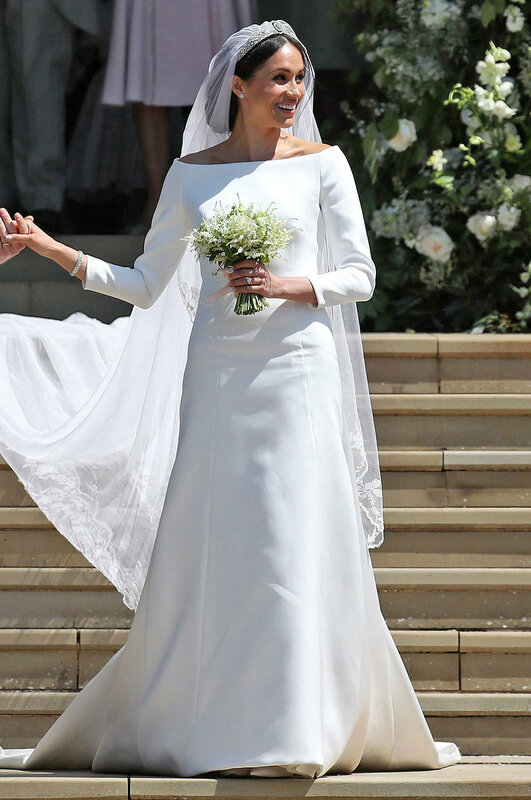 Here at the Boutique we are still obsessing over the royal wedding and Megan Markle's classic, clean gown! Her custom made dress featured a gorgeous full length gown made of structured, silk duchess satin with a boatneck collar and long, straight sleeves. 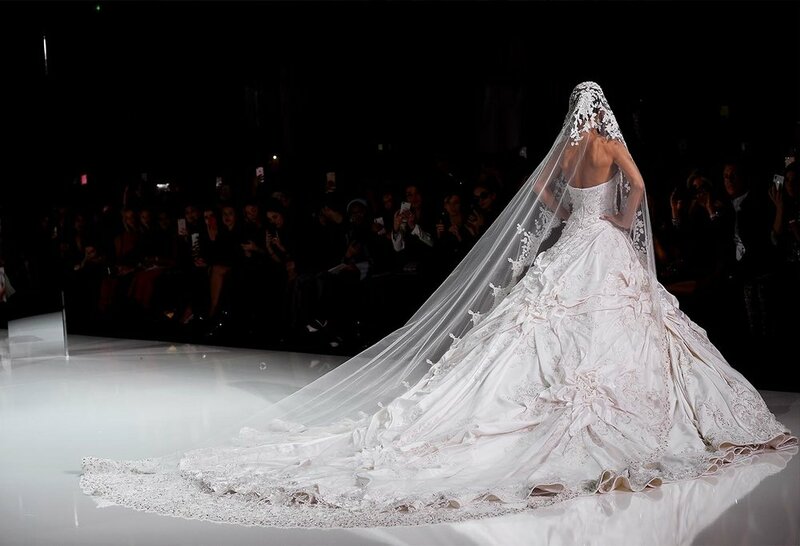 Designers and brides all over the world will take inspiration from the Duchess of Sussex's wedding gown, we are sure of it! 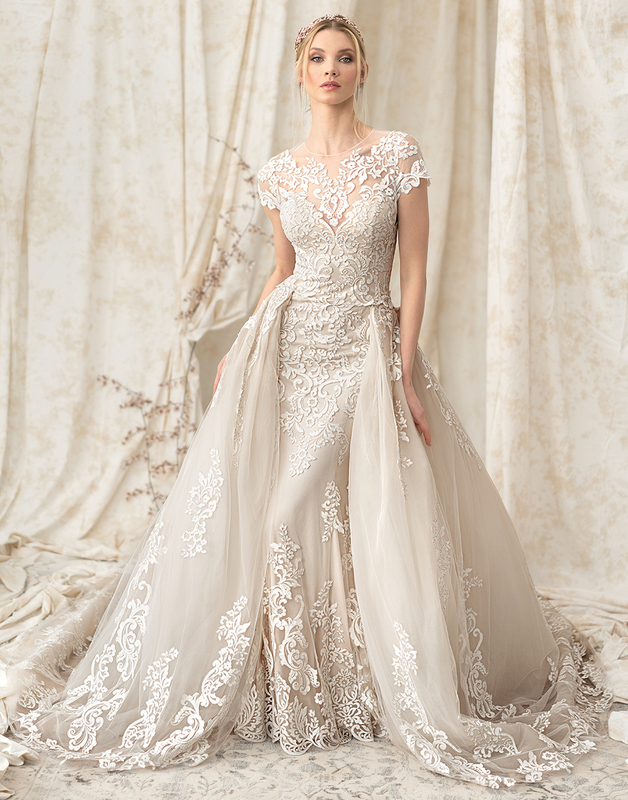 Below we have listed 10 simple and classic wedding gowns with similar features as the Princess's gown, so you can achieve her wedding look too! After months of whispers and theories, we now have all the details on Meghan Markle’s wedding dress. The bride wore the Parisian label Givenchy, designed by Claire Waight Keller the first woman to head the esteemed French fashion house as Artistic Director. Prior to taking the helm at Givenchy, Ms. Keller served as creative head of Pringle of Scotland and Chloé -- globally influential fashion houses. Her Royal Highness, The Duchess of Sussex Meghan wore a gorgeous full length gown made of structured, silk duchess satin with a boatneck collar and long, straight sleeves. Her silk tulle veil consisted of 53 embroidered flowers representing all the countries in the commonwealth. 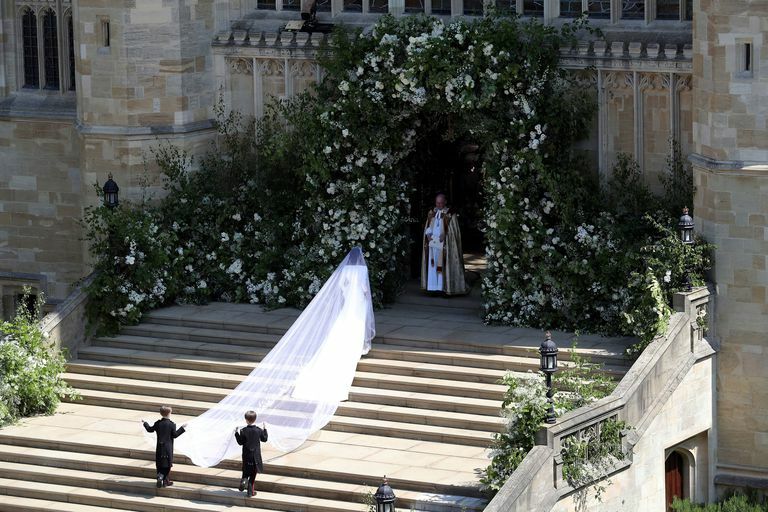 The full length veil was 16 feet long and helped to create a dramatic entrance before she said “I do.” Although this gown was not what we imagined the Princess walking down the isle in, her dress was arguably one of the most elegant bridal looks in royal history. We Have Only Positive Things to Say! Since the big reveal, negative comments have whirled the internet stating that the Duchess' dress did not properly fit her and appeared too large for her. These comments have caught our attention because obviously these statements are offensive to a designer like Givenchy. Meghan Markle’s dress was intricately made in order to hug her body in all the right places. According to Harpers Bazaar, Givenchy workers spent hundreds of hours diligently sewing and washing their hands every 30 minutes to ensure pristine tulle and threads. After doing some research, we found that the designer, Claire Waight Keller, actually drew inspiration for her dress design from historical royals. 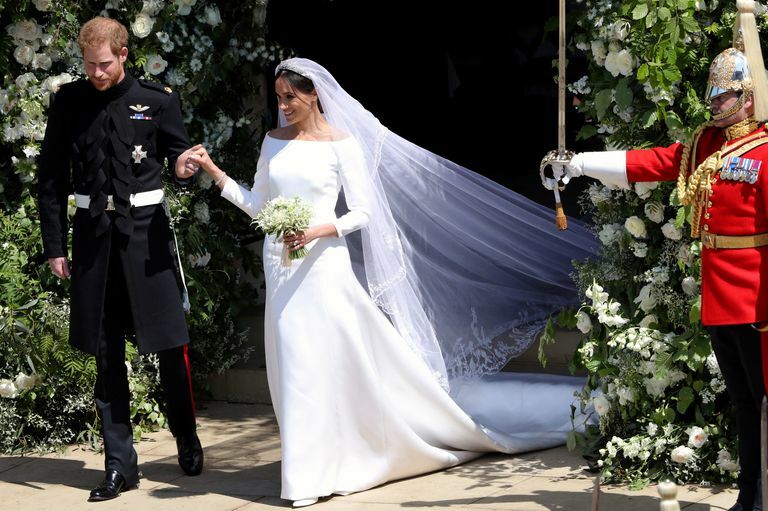 Despite expectations of extravagant gowns and a classic princess style, Markle chose to stay true to herself and reflect her own personal style through her gown and we are so glad she did! Her entire look screamed chic, modern, and elegant. Meghan Markle’s bridal look will be imitated for years to come. Get the same look as the Princess with our wedding gown listed below! We have come up with a list of wedding decoration trends we have seen this year and predict to see in the future. Enjoy! Balloons have become all the rage this year. Whether you plan to use them as a decoration or for a photo booth, the possibilities are endless! This is an inexpensive way to take up lots of space on your big day! This new trend is a fun way to entertain guests! 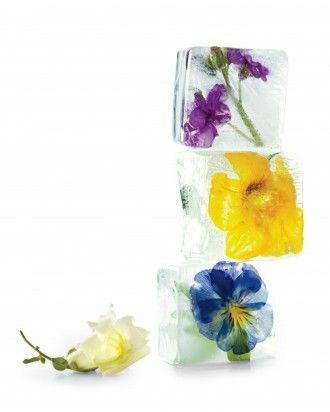 Whether you use edible flowers in punch, ice cubes or popsicles, this trend is sure to give your wedding the perfect touch! Vintage bikes have taken over instagram and they are appearing in weddings now too! Boutiques and planners everywhere are using them to decorate. Paint the bike to match your wedding theme and add a basket full of flowers. This trend is sure to grab your guest's attention! Place potted plants along your aisle to create a unique touch to your decorations! You can customize these flower pots any way you like and then take them home with you or use them as guest favors after your reception! When it comes to weddings, the fun factor should be in full force. There's no better way to create a fun atmosphere than with bright, colorful rainbow colors! Pops of colors have proved to be a trendy style to start out the year and we hope to see more of it this season! 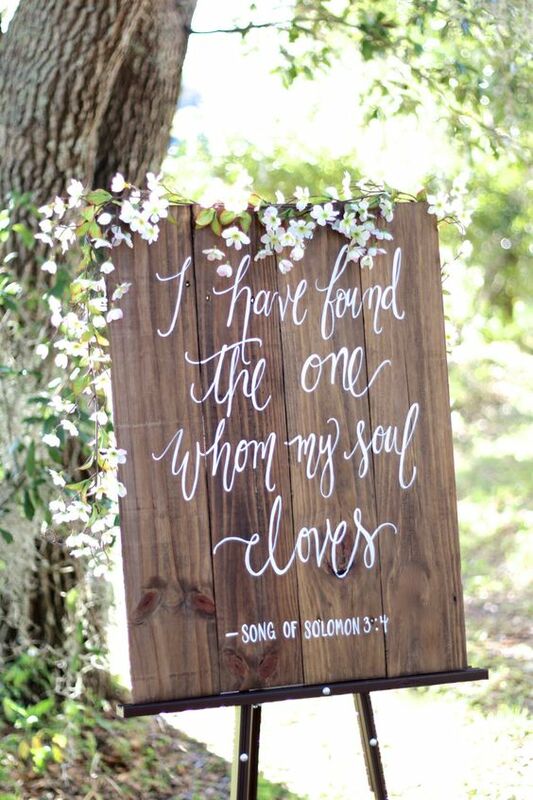 Wooden signs with quotes or bible verses painted on them have become so popular! They can be simple plaques or statement pieces. Either way, we believe we will see them more in future weddings for sure! In November of 2017, Prince Harry of Wales announced his engagement to Ms. Meghan Markle. The couple will be getting married at St. George's Chapel, Windsor on Saturday, May 19th. Their big day is quickly approaching and with the world watching, you can bet the future Princess's wedding gown will be extraordinary. While we await the big reveal, our team here at The Boutique by B.Belle Events ("TheBTQ") have predicted what Meghan Markle's dress and accessories will look like. Meghan wore a black Ralph and Russo gown for her engagement photos and rumor has it, she could be wearing a gown made by the same designers on her wedding day. The dress she chose for her engagement photos featured a beaded and embroidered see-through top and a frothy, black skirt. Several news articles have made it clear that Meghan's future grandmother, the Queen, must approve her wedding gown before the big day. So, while Meghan's style has proven to be different from her future royal family's, we should still expect to see something classy and elegant which will meet the Queen's approval. Below, we provided a Ralph and Russo wedding gowns from their Spring Collection which could potentially be similar to the design of Meghan's. However, as much as we enjoy predicting her wedding day ensemble, Meghan Markle's wedding gown will be made and tailored specifically for her and is sure to be a one of a kind. We predict Meghan Markle will go above and beyond expectations. Rather than a simple wedding dress, we believe the future Mrs. will show up wearing a lace fit and flare gown with a detachable train. A detachable train gives off a ballgown feeling and of course a ballgown screams Princess. However, a lace fit and flare would be unlike former royal weddings and Meghan Markle is making us feel as if she'll give the people something extravagant to see. Whatever the future Princess will show up wearing, we are sure that it will set a wedding gown trend for years to come.